Google Talk Password Recovery is a powerful password recovery tool that enables you to instantly recover the login and password information for your Google Talk, Gmail Notifier, Picasa, Google Desktop accounts. It works when the "Remember my passwords" or "Sign me in automatically" tickbox is checked in Google applications. Safely recover and backup your Google passwords in case of computer repair or upgrade. Instantly find your lost Google Talk & Gmail password. Find and decrypt passwords for your Google Talk, Gmail Notifier, Google Desktop, Picasa and Google Photos Screensaver accounts. Google Talk Password Recovery also includes an universal password recovery tool: Asterisk Password. It enables you to reveal passwords hidden behind the asterisks in password fields for most of Windows applications, not only for Google Talk, Gmail Notifier, Google Desktop and Google Picasa. Find, decrypt and recover lost or forgotten passwords for your Google Talk, Gmail Notifier, Picasa and Google Desktop accounts, with just one click. You have an old Google Talk account you'd like to get into, but you can't recall the password any longer. Forget your Google Talk password? But Google Talk instant messenger could log in to your account automatically each time when you turn on your computer. How to recover the saved password in Google Talk? Windows reinstallation will result in losing all your passwords saved on your local computer. You have forgotten Gmail account password. The only way you can access the account is through Gmail Notifier which must have it saved. You need to retrieve your saved Gmail password from Gmail Notifier. You forgot Gmail password and security question answer. "Your software is wonderful. It gave me the chance to recover a password that I had forgotten since 2006. Now I can log into Google Talk instant messenger and access my gmail account as well. Congratulations and thanks again for your marvelous tool, that WORKS!!!" "I just wanted you to know that I am using Google Talk Password Recovery 1.0 and it is a very good product." "Congratulations for producing a great tool! it's everything you claim it to be, and more." "All my work are based on Gmail, losing password was terrible thing for me. Thank god, I got it back with your password utility." 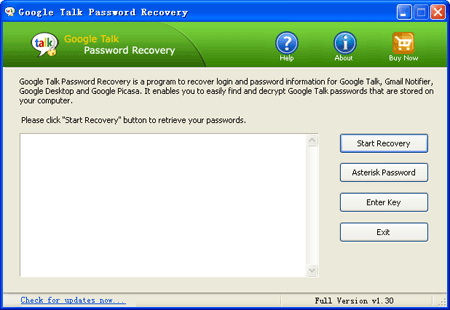 Learn How to recover Google Talk passwords easily with Google Talk Password Recovery.